These flapjacks are a little bit naughty, but so nice! I’ve added golden syrup which makes them chewy and sweet. 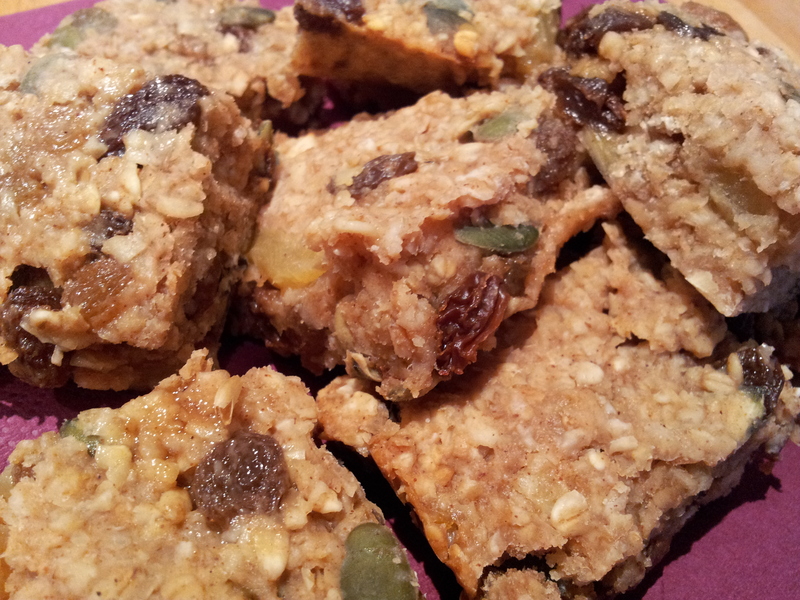 However, they use yoghurt in place of butter so they’re lower in saturated fat than conventional flapjack recipes. They are a filling, healthier option for when you need a little sweet treat. I just love how you know exactly what’s in them, if you’d prefer them less sweet, then add less syrup! Although I must say, the gooey, chewy sweetness combined with the cinnamon flavour makes this recipe one of my personal favourites. 1. Preheat the oven to 220’c and line a baking tray with greaseproof paper. 2. Mix together the oats, sultanas, seeds and cinnamon in a large bowl. 3. In another bowl, mix together the golden syrup, yoghurt and apple. 4. Add the liquids to the oats mix and stir the mixture until all the oats are covered and sticky. 5. Tip the mixture into the lined baking tray and flatten it down slightly. 6. Pop into the oven and cook for around 30 minutes until the top appears golden. 7. Slice into 12 pieces and store in an airtight container. The nutritional data below is per portion based on the above yielding 12 flapjacks. If you like these, try my Apricot and Pistachio Flapjacks.